"Where on Earth is the place in this image?" "What are these physical features?" Location on the Earth, that is, precise location, is determined by using latitude and longitude. You can read the center latitude and longitude of your image off of its "Detailed Information" page in the Data System. Our image, STS081 ESC00212631, has a center latitude of 30.8777° N and a center longitude of 80.937°E. Generally, location is given by the names of places and their physical relationships to other places. 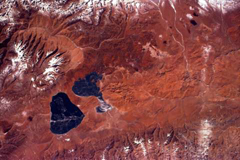 For instance, our image is located in the southwestern corner of the Tibetan (Xizang) Autonomous Region of China. The borders of Tibet, India and Nepal meet just south of the lakes. Take a look at the "Surrounding Area Map" which you can also get to from your image in the Data System. Then look at maps of your area in as many atlases as you can. Look at several different maps because you may find different names for the same places. Also, there are many different kinds of maps and each one will label slightly different things, so you'll learn more. For instance, the image of Tibet we are investigating here contains places that have names in four different languages! We had to look at several atlases and maps before we understood that. A good way to start the process of identifying places in your image is to make a copy of a map of your area from an atlas. You can trace it or use a copier. Tracing can be good because your map will be simple with only what you want to put on it; but a machine-made copy can be good because it already has many things labeled. Or use both. Find the name of the country your image in and its state, region or province. What are the names of the communities in the image? What do they call the mountains, hills, valleys, plains, oceans, seas, lakes, rivers, swamps, deserts and other physical features? Make a list of what you have and then focus on one of them at a time. Investigate all the names you have learned so far; since you probably don't know where you can find the best information about your region, you should use every piece you have to help you get more pieces to the puzzle. There are no cities in this very remote part of the world, but there are several monasteries that serve important pilgrimage sites; there are a few seasonal villages and the ruins of ancient kingdoms. The prominent physical features are the mountains, lakes and rivers. There are two distinct ranges of mountains in our image, the Gangdise Shan and the Himalayas. We can just see the northern fringe of the Great Himalaya Mountains along the lower left edge of our image. The Himalayas (the Abode of Snow) are the world's highest mountain range, containing all top ten of the world's highest peaks. 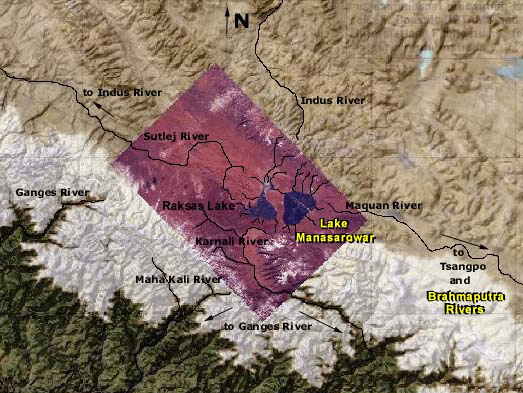 The Himalayas are a non-continuous range; they are segmented at various places into subranges. In the places where the Himalayas consist of separate clusters of mountains, which grouped together by regions are called Himals, such as the Gharwal Himal. Sheep carrying packs filled with salt across Tinkar Pass on the way to India from Tibet in the summer of 1936. The Zaskar Range is the part of the Himalayas just up off the Sutlej Valley floor along the southwestern edge of our image and contains the most heavily traveled mountain passes between India and Tibet, Tinkar Pass and Shipu La. Mountain ranges near the Himalayas. The mountains to the north of the lakes are the Gangdise Shan, or Kailash Range. 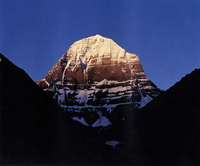 They contain a mountain that is revered as the most holy mountain in the world by Buddhist, Hindu, Jain and Bon-po adherents: Mount Kailash, which at the modest altitude of 6742 m. (22,114 ft.) has been a pilgrimage destination for well over 2000 years. This whole region has been named the Trans-Himalaya. The mountains of the Trans-Himalaya are in between the real giants of the Himalaya: Everest at 8848 m. (29,028 ft.), the tallest mountain in the world, to the southeast in Nepal and K-2 at 8611 m. (28,250 ft.), the second tallest mountain, to the northwest in Pakistan. 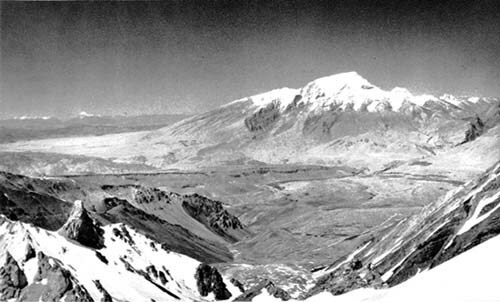 The highest peak in the image area, Gurla Mandhata, is 7728 m. (25,355 ft.) tall. The most holy mountain, Mt. 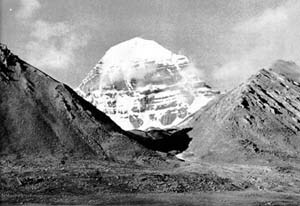 Kailash (also known as: Kang Rimpoche and Mt. Meru). Photos courtesy of Arnold Heim from Throne of the Gods. This area has also been called the Tethys Himalaya by geologists and the reason for that name is told by the story of plate tectonics. The land that makes up these mountains was once the bottom and shores of the ancient Tethys Sea. The ongoing, millions of years long collision of the Indian and Eurasian continental plates has created these mountains and is still pushing them higher. Gurla Mandhata, 7728 m. (23,355 ft.), with Mt. Kailas to the left in the distance as seen from Tinkar Lipu Pass looking northeast. The Taklikot Lamasery is at center left beneath Gurla Mandhata. Photo courtesy of August Gansser from Throne of the Gods. The highest peak of the Himalaya in our image area, Gurla Mandhata, is only of average height compared to the many other tall peaks of the Himalaya Mountains. The Nepali-Tibetan border passes to the right and very near the peak (pictured to the right). 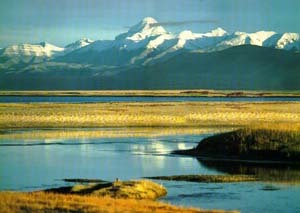 The shoreline of Lake Manasarowar looking north toward Mount Kailash, the most famous peak in the Kailash Range. Photo courtesy of Hans Forst from Verbotene Konigreiche im Himalaya. 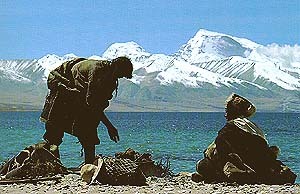 Two pilgrims are resting on the shore of Lake Manasarowar, looking southward toward the Himalaya and the peak of Gurla Mandhata. It is considered of great spiritual benifit to bathe in the waters of Lake Manasarowar. Can you imagine how cold this water must be even in summer? Photo courtesy of Hans Forst from Verbotene Konigreiche im Himalaya..
Lake Manasarowar at an altitude of 4727 m. (15,510 ft.) is the highest freshwater lake in the world. 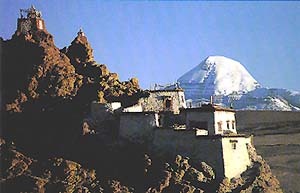 It is fed by glaciers on the Himalayan peak Gurla Mandhata and in the Kailash Range. It’s depth ranges to approximately 80 m. (262 ft.). 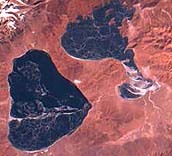 It is connected to neighboring Raksas Lake but it does not drain to the outside. There are hot springs on the isthmus between the two lakes. As remote and harsh as this region is, it has been known and journeyed to for a very long time. For centuries this lake and Mount Kailash have been holy pilgrimage sites for Hindu, Buddhist, Jain and Bon-po adherents. The Western historians Pliny and Ctesias recorded as early as 100 AD that the natives collected pitch along these shores. A search for the lake's name on the World Wide Web brought up several sites that offer pilgrimage tours to the area. From those sites we learned many of the names of the mountains, villages and monasteries that surround the lakes and their religious significances. From there we were able to broaden our search for information. To Tibetans, it is known as Ghang Rimpoche (Precious Jewel of Snow). They see it as the navel of the world. Kailash from the monastery at Chiu Gompa. Photo courtesy of Hans Forst from Verbotene Konigreiche im Himalaya. To Buddhists, Kailash is the abode of the Arhats (those who have attained paradise) as well as the Abode of the Gods. For the more ancient religion of Bon it is the site where its founder, Shanrab, is said to have descended from heaven. For Hindus, it is their spiritual center of the universe. It is described in their mythology as a fantastic "world pillar" 84,000 miles high, around which all else revolves, its roots in the lowest hell and its summit reaching the heavens. On top lives their most revered God Shiva and his consort Parvati. Most ancient cultures have viewed the world as symbolically representing an unseen and unseeable reality, perhaps paradise. 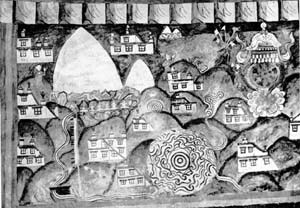 This 1936 photograph (right) of a very old Tibetan map of Kailash and Lake Manasarowar comes from a fresco in the lamasery at Tinkar in Nepal; it is a good example of that kind of viewpoint. Lake Manasarowar looks like this along the shoreline. 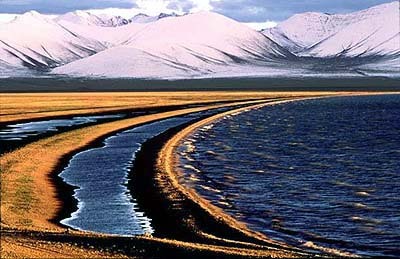 Photo courtesy of http://www.goldenbridge.net/Tibet-LakeManasarovar.htm. Well, we know from the Detailed Information page in the Datasystem for this image that it was taken on January 13, 1997 at about 6:54 am Greenwich Mean Time. Since Tibet is in the Northern Hemisphere, it is winter in January; so it could be ice or snow. When we saw the ground photographs (we don't know what time of year these were taken), we thought that it could be that the lakes were very shallow and we were seeing sediments that made up an uneven bottom showing through. Since the lakes are fed by glaciers and they don’t drain out to any rivers, their volumes and depths would vary from year to year. They would depend upon the amount of snow that fell and melted, the amount of water that evaporated during the dry season and the amount of sediment that was delivered with the runoff of snowmelt. 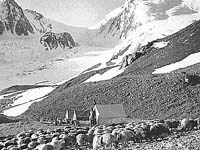 The whole area has been marked by the activity of alpine glaciers. One of the signs that glaciers leave behind when they melt is piles of unsorted rocky debris called glacial till. The photo below shows hummocks of galcial till in the area between the lakes. These sorted circles of gravel and stones occur naturally on an island north of Norway. Just how the circles were produced is still debated though their appearance is associated with recurrent freeze and thaw cycles. Photo courtesy of Professor Bernard Hallet, Quarternary Research Center, University of Washington, Seattle. One of the atlas maps we looked at even showed the lakes joined as one but we read that the Hindu and Buddhist traditions have recognized two distinct lakes for centuries. So, as you can see we had conflicting data to work with. We came across the picture to the left while looking for possible explanations for the patterns in the lakes. 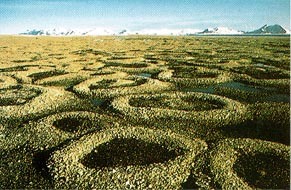 The formations are called "patterned ground". Patterned ground occurs in places where the ground goes through repeated cycles of freezing and thawing. Searching the web turned up many similar photographs and the names of a couple of specialists in patterned ground. Since we were at a dead end with our resources, we decided to try asking an expert if they would help us out. We e-mailed our request to an expert who was kind enough to look at our images. The response we got teaches a few things about how to come up with a hypothesis (or how to make an educated guess) and what makes an expert an expert. The lake from our original picture. The white color of the patterns is similar to the color of the snow on the surrounding mountains and (probably frozen) rivers and lakes. The patterns are built up on the eastern ends of the lakes; like something blown to the side by wind. In fact, the winter winds here are very strong and they are out of the west, which could cause just exactly what we can see here. The patterns look very much like jumbled sea or lake ice. A cracked pattern forms when slabs of ice, pushed by wind, jam up against one another then drifting snow can accumulate at the junctions. The accumulation of drifting snow at cracks and junctions in the lake ice is something you can see in early winter in parts of Alaska in years when there is only a little snow. The patternless ice on the eastern margin is probably that way because it froze massively after the evacuation of all its slabs of mobile ice. It was suggested that we could verify the hypothesis that the patterns are caused by ice and snow by looking at ground photos taken in the winter or satellite images taken in the summer. We'll have to go looking for some. Our thanks to Professor Brad Werner of Scripps Institute of Oceanography and his graduate student Lawrence Plug.